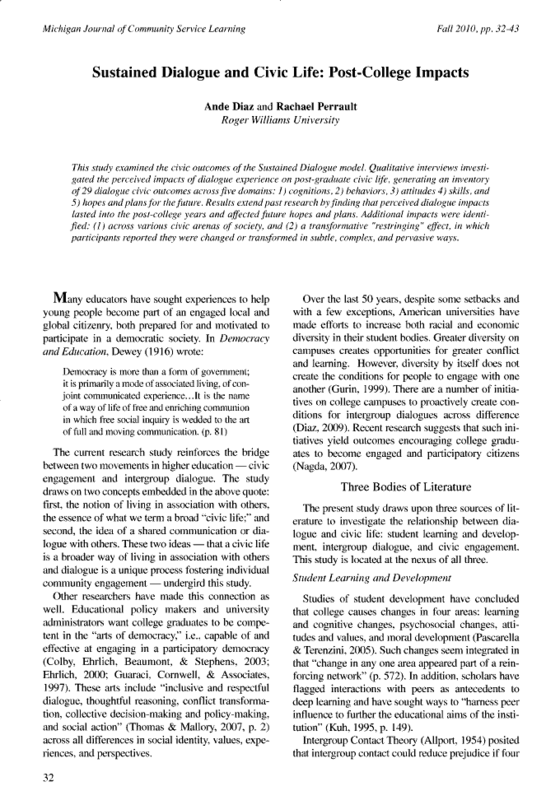 This study examined the civic outcomes of the Sustained Dialogue model. Qualitative interviews investigated the perceived impacts of dialogue experience on post-graduate civic life, generating an inventory of 29 dialogue civic outcomes across five domains: 1) cognitions, 2) behaviors, 3) attitudes 4) skills, and 5) hopes and plans for the future. Results extend past research by finding that perceived dialogue impacts lasted into the post-college years and affected future hopes and plans. Additional impacts were identified: (1) across various civic arenas of society, and (2) a transformative “restringing” effect, in which participants reported they were changed or transformed in subtle, complex, and pervasive ways.